A new study published in BMC Medicine suggests that eating just a handful of nuts every day can reduce your risk of developing many chronic diseases, including cancer and heart diseases, which account for more than 25 million deaths per year worldwide. Nuts contain protein, healthy fats, vitamins, minerals, fiber, antioxidants, and many beneficial phytochemicals. Some research suggests that eating nuts might lower cholesterol and help maintain healthy blood sugar levels in people who have diabetes. The researchers analyzed the results of 20 population studies of more than 800,000 people. Studies were performed over a period of several decades up to the present to see if there was a relationship between eating nuts and lower risk of disease. Studies included all nuts, which are generally divided into two types: tree nuts, which include walnuts, pecans, cashews, pistachios, hazelnuts, almonds, and Brazil nuts, and peanuts (technically legumes). The researchers only included studies that focused on nut intake and five key health outcomes: coronary heart disease, stroke, cardiovascular disease, cancer, and early death. The studies included both men and women from North and South America, Europe, Southeast Asia, and Australia. Then the researchers looked at the optimal amount of nut intake. They found that eating one 28 gram serving of nuts per day (about 1 ounce, roughly ¼ cup) reduced risk of coronary heart disease by 29 percent, stroke by 7 percent, cardiovascular disease by 21 percent, cancer by 15 percent, and death from lung disease, diabetes, and infections by 22 percent. But the researchers discovered that 20 grams per day—just a small handful—was the optimal intake, seeing little evidence of further reductions in risk above this amount. According to calculations by the researchers, this could prevent as many as 4.4 million early deaths every year worldwide. 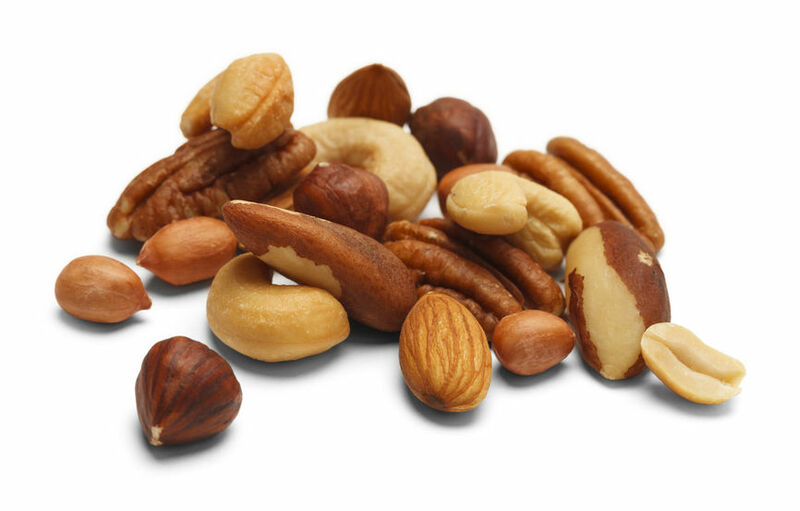 Previous research has shown that people who eat a lot of nuts tend to follow a healthy lifestyle, but the researchers noted that even when they took smoking, alcohol intake, physical activity, body weight, and diet into consideration, the beneficial effects of eating nuts persisted. Toss nuts into things you eat every day—breakfast cereal or oatmeal, salads, vegetables, or low fat yogurt. Or just eat them plain for a healthy snack. Lightly salted nuts are great substitutes for less healthy salty snacks like potato chips or other highly processed foods. The work was supported by Olav og Gerd Meidel Raagholt’s Stiftelse for Medisinsk forskning, the Liaison Committee between the Central Norway Regional Health Authority (RHA) and the Norwegian University of Science and Technology (NTNU), and Imperial College National Institute of Health Research (NIHR) Biomedical Research Centre (BRC). Previous Previous post: HealthTalk: How Can I Eat Healthy Portions at the Holidays Without Measuring?